In today’s legal environment, matching your needs with the correct firm is crucial to the successful outcome of your legal matters. As an informed consumer of legal services, you need to be sure that the firm you select is in fact qualified to handle the matter at hand. To that end, below are brief descriptions of the types of matters we successfully handle. We have made a commitment to these areas of the law so that we can assure you the best possible legal representation. Our firm performs real estate closings for individuals, builders, mortgage lenders and title companies. We assist clients with all aspects of the purchase, sale and refinance of real estate. Our services include negotiating and drafting contracts, obtaining documentation required for a mortgage commitment, reviewing the mortgage commitment with our client, giving general advice regarding the closing process, preparing closing adjustments and closing statements, assuring that proper releases of prior mortgages and encumbrances are obtained, issuing title insurance policies and reviewing the deed, note and mortgage and other documents related to the closing. The attorneys at our firm take great pride in making sure that each client understands the real estate process as it relates to his or her transaction. The form of business entity chosen by a business potentially affects every aspect of its future operations. Our firm assists our clients in formation of the chosen business entity as well as business planning to decide whether to operate as a sole proprietorship, Limited Liability Company, partnership, or corporation. We advise our clients about ways to limit the personal liability of individuals who are investing in the business. We work closely with our clients’ tax advisors to coordinate the legal and tax aspects of the new business entity. Our firm represents individuals who have been injured due to the negligence of others, such as automobile accidents and slip and fall cases. We assist clients in receiving compensation for their injuries and recuperating their medical expenses, lost wages and the like. We advise clients at every point in the litigation process including evaluating the case, consideration of settlement offers, the discovery process and preparing for trial. Contingent fee arrangements are available for those clients with qualified cases. 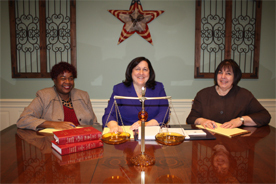 We handle all aspects of Probate and Estate Administration of decedent’s estates. Probate is the legal process by which a person’s Will is allowed by the Probate Court. Estate Administration includes the probate process as well as non-probate transfers of the deceased’s assets, such as life insurance, annuities, qualified plans, and trust assets and compliance with applicable estate tax requirements. We assist the Executor or Administrator of the estate in the gathering, valuation, accounting and distribution of the decedent’s assets. We also represent clients in the Probate Court for matters involving Conservatorships, Guardianships, Removal of Guardian, Temporary Custody, Termination of Parental Rights and Change of Name.